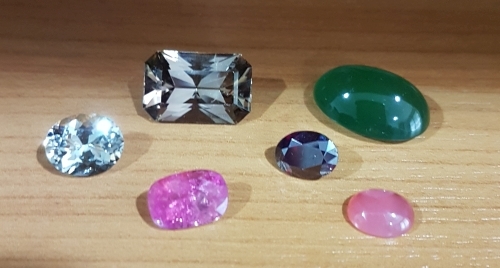 We supply rare stones to fine jewelers and collectors around the world, including Burma ruby, Ceylon sapphire and the finest spinel, topaz and garnet. But in recent years we've seen a growing interest in rare and unusual, even obscure, gem varieties. Gem collectors have always sought out the finest specimens, with an eye for stones that are likely to appreciate in value over time. Strictly speaking, all gem-quality minerals are rare. That is because only a tiny fraction of the minerals found in the earth are sufficiently transparent and clean to be called gemstones. The rarest varieties tend to be obscure and virtually unknown to the general public. They include unusual gems like benitoite, jeremejevite, grandidierite, cobaltocalcite, cuprite, oligoclase and pezzottaite. These are gems for the dedicated collector and are only occasionally set in jewelry. You'll find that we have significantly expanded our collection of rare varieties and we continue to specialize in rare gems for collectors. You'll find an index on our home page in the Rare Gem Varieties section, and some notable examples in this month's newsletter. This month we feature some rare collector gems from our collection, including a very rare Benitoite that we've just acquired. Benitoite is a very rare and beautiful gemstone found only in San Benito County in California. Gem-quality crystals are small -- under 1 carat -- but the best material has a vivid blue color and a refractive index higher than sapphire. This stunning diamond-cut Benoite is a fine specimen for the serious gemstone collector. Guaranteed natural and untreated. Jeremejevite is a rare aluminum borate mineral that sometimes occurs in a gem-quality clear crystal form. It is usually classified as one of the rarest gemstones in the world, along with very rare stones as painite, taaffeite and poudrettaite. Facet-grade material, like this 1.68 ct violet-blue gem from Namibia, is especially rare. Guaranteed natural and untreated. Cobaltocalcite is a rare variety of calcite colored by traces of cobalt. This gem is notable for its highly saturated color and superb translucency, with an amazing glow when backlit. Gem-quality cobaltocalcites over 10 carats are very rare, especially in this vivid color. This fine specimen will delight the most discerning collector. Guaranteed natural and untreated by GIA, including a Notable Letter which states that "The large size, highly saturated reddish purple color and high degree of transparency makes this a notable cobaltocalcite." Brazilianite is a rare mineral that was first discovered in Minas Gerais, Brazil in 1944. Gem-quality specimens are highly prized by collectors. Brazilianite tends to be a vivid yellowish-green in color with excellent transparency and a vitreous luster. A rare gem Brazilianite in a very large size, nearly 13 carats, with exceptional brilliance and excellent fire. This is an unusually large specimen that would be a notable addition to any rare gem collection. Guaranteed natural and untreated. Grandidierite is very rare in gem quality, and transparent material is exceptionally rare, with most specimens under 1 carat. So this 2.30 ct Grandidierite is a special piece for the rare gem collector. Certified by GIA with a Notable Letter that describes this gem as "extremely rare" with "an appealing bluish green coloration." The GIA letter concludes that "the rarity of grandidierite makes this a notable gemstone." A very rare natural Melo pearl from Burma in a large size! This beautiful pearl has a creamy orange color with a porcelain luster and it displays the silky flame structure characteristic of the finest Melo pearls. A fine piece for the rare pearl collector. Guaranteed natural and untreated. 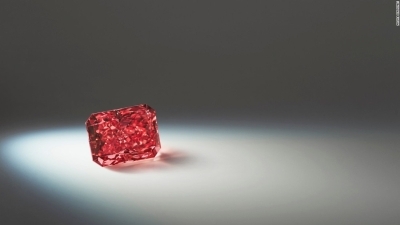 Rio Tinto has unveiled the largest Fancy Red diamond ever discovered in Australia. The 2.11 carat polished radiant cut diamond, known as The Argyle Everglow, is the centrepiece of the 2017 Argyle Pink Diamonds Tender – an annual showcase of the rarest diamonds from Rio Tinto’s Argyle mine. The diamond has been graded by GIA as a Fancy Red VVS2. Red diamonds are the rarest of all colored gems, with most known specimens under 1 carat. The Argyle mine in Western Australia is the world's biggest diamond mine based on the number of carats produced -- more than 800 million carats since mining began in 1983. Though most of the diamonds produced by Argyle are lower value brown diamonds, the mine is known for some ultra-rare pink, purple, violet, red, and blue diamonds. Indeed, the Argyle mine produces 90% of the world's rare pink diamonds. The Argyle mine is scheduled to close in 2021 so it is unlikely that another diamond as rare as the 2.11 ct Fancy Red will be found there again. Sapphire mining in Madagascar is artisanal, carried out by independent miners with pick and shovel. There is hardly any mechanized mining, since the mines are mostly in remote areas inaccessible by road. Much of the mining is recovering alluvial sapphire by sifting gravel in riverbeds. The Malagasy government does not permit mining in the national parks (10% of Madagascar's land area is now protected national parks, including the environmentally sensitive rainforests). So in principle the environmental impact of sapphire mining should be relatively slight. Having said, there have been some incidents of a gemstone rush reminiscent of the California gold rush in 1849. In November 2016 there was an important find of sapphire and ruby near the town of Didy in northeastern Madagascar. More than 45,000 miners rushed to the area, which is in a protected rainforest. For a few months the government was unable to control unregulated mining before soldiers moved the miners out. This pattern has been repeated several times in the history of Madagascar gem mining. From an ethical point of view, gemstone mining is an important source of income for hundreds of thousands of people in Madagascar. According to UNICEF, 81.3% of the people in Madagascar earn below the international poverty line of USD $1.25 per day. So the Malagasy government and international NGO's are trying to find a way to balance economic development and conservation.